San Diego Comic-Con 2015 just wrapped up, and we’re still trying to decompress and soak in all that we experienced. This was personally my favorite SDCC I’ve been through, for many reasons. I’ve chatted with other Shortboxed editors who went and these are some of our favorite moments from 2015 and we’re excited to give you a tiny glimpse of our con experience. Princess Leia, Luke Skywalker and Han Solo reunion. 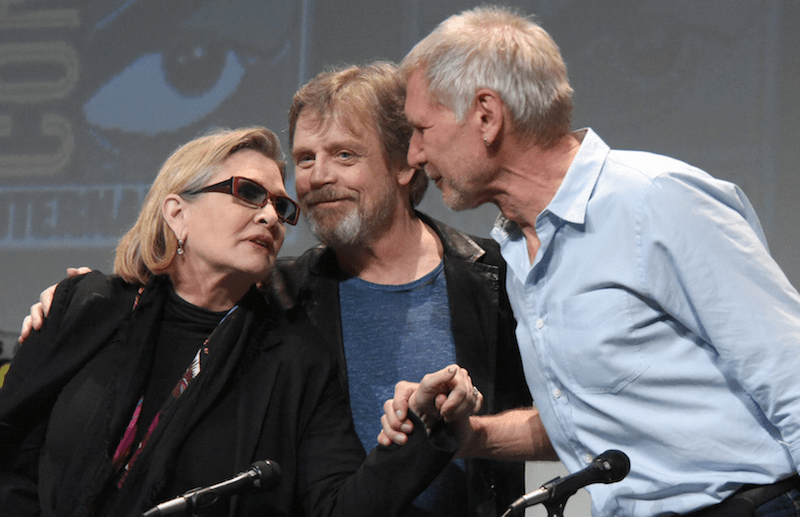 During the second half of the Star Wars panel, JJ Abrams brought out the Holy Trinity of the original Star Wars cast – Carrie Fisher, Mark Hamill and Harrison Ford. When Ford came out, all of Hall H went into a frenzy and gave him a standing welcome. We were among the first on our feet! Marvel Unlimited Plus member-only panel. On Sunday we attended a members-only panel, and it did not disappoint! There were only about 50 people in the room, but we got to see some amazing stuff. We were treated to early looks at upcoming comics, 7 minutes of Ant-Man footage, the entire first episode of the Guardians of the Galaxy animated series, and an Avengers: Infinity War teaser trailer, which we were shown twice. We also all received Thors 1 variant issues. DC’s Super Hero Saturday Night panel. During this epic 3 hour long panel, we got to meet the casts of Arrow, The Flash, Gotham, Legends of Tomorrow and Supergirl! We watched some exclusive footage, got first word of news, watched a first-look trailer for the new animated series Vixen (looks great!) and got to watch the entire pilot for Supergirl (also looks great!). The Conan O’Brien Show. We got super lucky and managed to score tickets to the first taping of Conan O’Brien at Comic-Con, and it was hilarious! On the show he interviewed Elijah Wood, Chris Hardwick aka the Nerdist and had a lightsaber duel with Seth Green. Each attendee walked away with an SDCC Exclusive Conan Funko Pop toy, too! Game of Bloggers meetup. Being relatively new to the scene (Shortboxed is about a year old as of this writing), we were so excited to meet other people within the blogging community. Being able to meet Tony Kim aka Crazy4ComicCon in person was a pleasure – he’s such a genuinely nice and pleasant fellow, and a very positive force among the community. We also got to meet a bunch of other bloggers as well, so “hello!” to all our new friends! The best part, however, was meeting people who actually read Shortboxed! It was very humbling and really inspires us to create great content for all our readers, knowing you’re out there! Meeting the cast of Doctor Who. 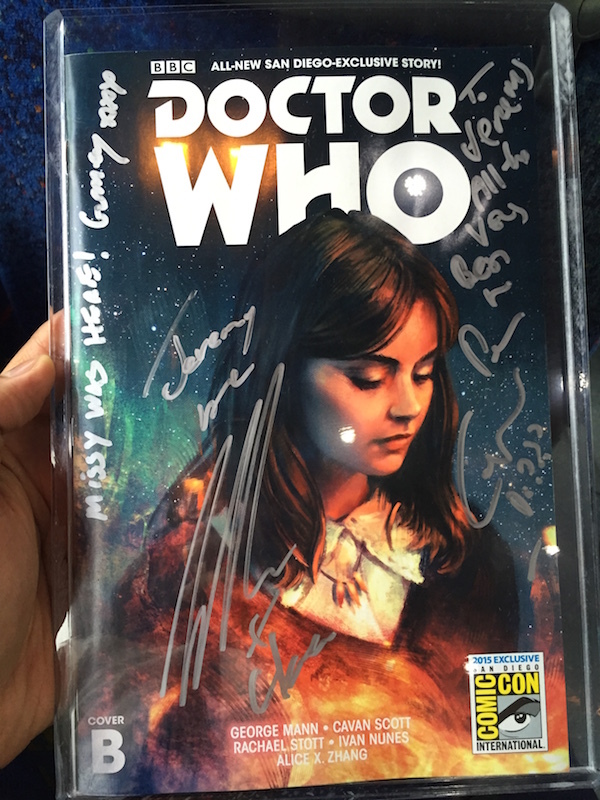 As a bonafide Whovian, Shortboxed editor Jeremy was stoked to meet some of the cast, including Michelle Gomez, Peter Capaldi, and Jenna Coleman and being able to chat with them and come away with their signatures. Check it out! Meeting Hendo Art in person. 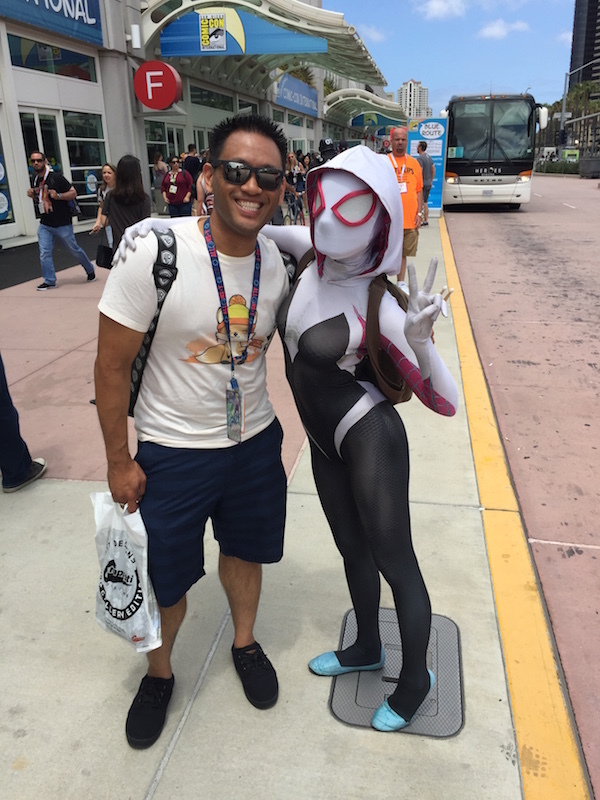 Jeremy also got the chance to meet one of his favorite cosplayers @hendoart in front of the convention center who cosplays as the best Spider-Gwen and is super friendly to boot. Awesome! Jeremy making his son’s costume at his first San Diego Comic-Con. Just look at the little guy! If only Jeremy would make costumes for the rest of us. Surprise Star Wars Concert. 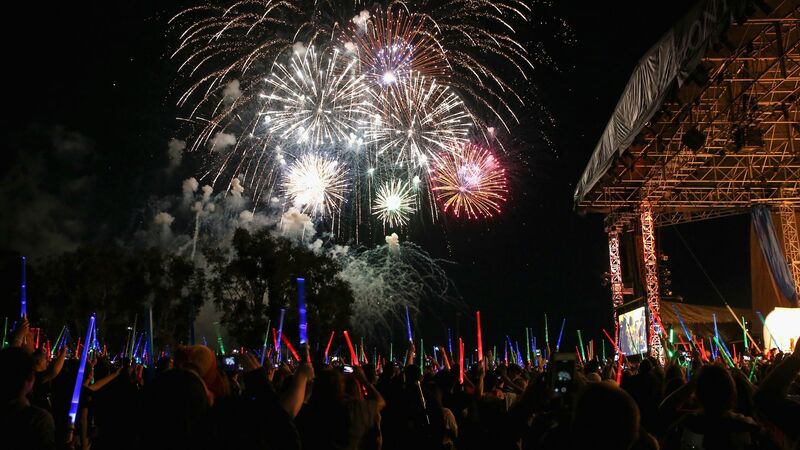 As most people have probably heard by now, JJ Abrams surprised all 6,500 people in Hall H with a surprise concert out on the marina with the San Diego Symphony playing music from Star Wars. We were escorted to the marina by Stormtroopers and treated to an awesome private party with food, drinks, a concert and an amazing fireworks show. Oh yeah, and we all got free lightsabers! This was my single fondest moment of Comic-Con and one I will never forget. To be surrounded by that many people who love Star Wars and were geeking out super hard was such an awesome moment. 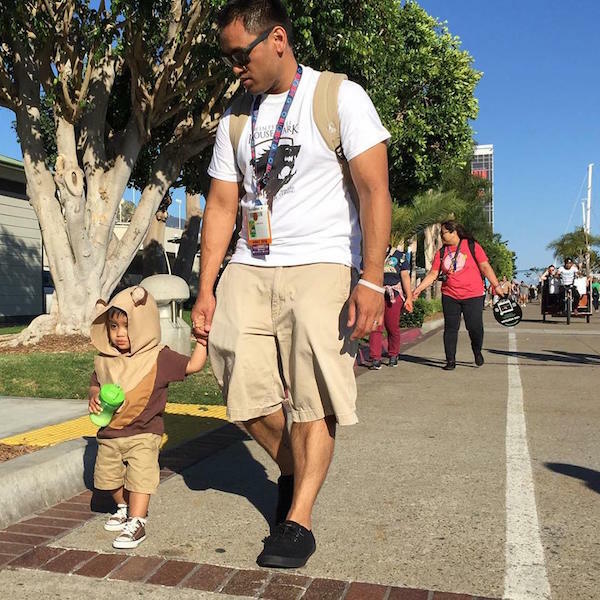 We experienced so, so many wonderful moments at Comic-Con 2015 and we wish we could share them all with you, but that might take you hours to scroll through! Already planning for 2016! What were some of your favorite moments? Tweet at us and let us know!